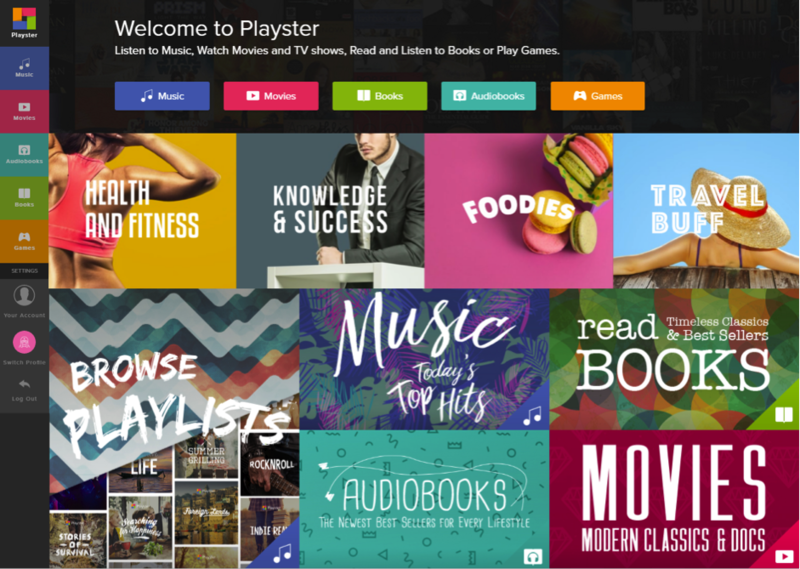 Playster is a new streaming and multimedia service that offers entertainment buffs a different kind of subscription to music, books, audiobooks, games and movies. It allows subscribers to access all of these media types with one subscription — a great feature that makes Playster unique and really sets it apart from its current competitors. Let’s take a closer look at their service and disclose some of the best benefits of using this application. In addition to bringing all of your favorite entertainment together in one place, Playster also offers some other really cool features, such as the ability to switch easily between media types, enjoy five simultaneous logins with custom user profiles and a family plan, so every subscriber can maintain a personalised account. Another great perk is that Playster offers unlimited access to its entertainment. It is true to say that the service has no hidden fees or restrictions when it comes to content streaming. When you become a member of Playster, you will pay just $24.95 per month for their all-inclusive package or you can choose to simply sign up for the music package ($9.95) or book and audiobook package ($9.95). Playster’s catalog includes all types of content and titles from famous publishers, studios and labels, such as Harlequin, HarperCollins, StreetLib, Macmillan, and Paramount. Their partnerships with these famous distributors and publishers put a credibility seal on the service and guarantee that it features all types of high-quality content, including millions of songs, books, audiobooks, movies and games. Playster’s vast catalog includes ebooks and audiobooks from different genres, including everything from mystery to kid-friendly literature, history, romance and much more. As far as Playster’s music is concerned, it ranges from new releases to classics and spans across all genres, from rock to pop. There are also plenty of expertly curated playlists to help you discover new favorites and an especially cool feature called mood-based sorting, which offers custom suggestions based on what mood you’re in. From documentaries to action movies and films that will inspire your next great adventure, Playster offers a nice selection of movies and TV shows that the whole family can choose from. There’s something for all ages and lovers of different genres to enjoy. Playster offers games that are a great source of entertainment for casual players who are looking to pass the time and relax with an addictive game. If you access Playster through your computer, you will find everything from fun puzzles to educational games for kids and adventure games that are perfect for your morning commute. If you prefer to log in using the mobile app [Android – iOS ], note that you will be directed to a selection of games chosen for being perfectly suited for mobile play. In short, Playster compiles all types of entertainment and fun in one place. It offers its users a substantial digital content library in keeping with its slogan: Entertainment Unlimited. There are plenty of different kinds of competitive streaming websites out there these days, however, if you are searching for a high-quality application with limited restrictions, Playster may just be the best choice for you. There is no doubt in saying that it offers optimal convenience and simplicity that outshines what any other streaming website offers. The overall experience of using Playster is great and with new titles being added every week, the service is one smart choice. Why Should You Invest In SEO?